The guts of the n4 — top left is the PCM1795, four LM4562 (in SOIC form) in the top right, CM6631 in the lower left, and SST SST39LF010 Multi-Purpose CMOS Flash. The CM6631 from C-Media is a USB receiver chip that provides the capability to decode 32-bit, 192 kHz music in asynchronous high-speed USB 2.0 mode. I know it sounds unscientific and I have no blind test to provide you with right now, but in my experience, this chip provides a very slightly more clear-cut and fluent sound. The n4 seems to possess these qualities and it works perfectly fine as an USB-to-COAX module. I couldn’t hear any differences comparing the n4 to my other CM6631-based DAC with the both serving as a digital module. The PCM1795 is a high-end DAC chip from Burr-Brown (now within Texas Instruments), with a theoretical SNR (signal-to-noise ratio) of 123 dB. From what I’ve heard, the PCM1795 is very similar to the PCM1792, except with 32-bit rendering. 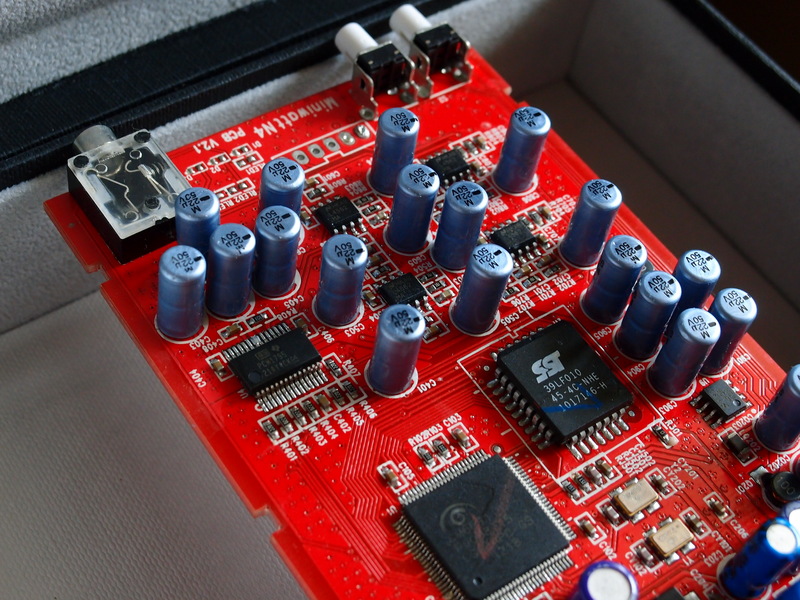 While 32-bit rendering has few real-world advantages outside of computer science class theory, it’s nice to know this DAC supports 32-bit, pairing with the 32-bit busing of the CM6631A. The PCM1795 — in this N4 at least, sounds a little more delicate and soft than usual. The imaging is good since it’s a bit shadowy. However, the PCM1795 seemed to sound softer and more shadowy than my more direct sounding CS4398, which I used in a comparison test. LME4562 is an operational amplifier (op-amp) known to be high-spec, high performance, and sound neutral as well as natural (not sterile). In a sense, I think it’s really a standard of musical transparency. The only negatives I’ve seen attached to it are that it can at times sound too sterile or plain. In this DAC, they selected to use LME4562 in both the RCA- and headphone-out section, I think. miniwatt n4 US$348 Now, Limited Special Offer – One Time Only!